The Patriot Burst Solid-State Drive (SSD) is the perfect way to enhance computer performance. Burst offers transfer speeds at up to 560 MB/s read and 455 MB/s write speeds to eliminate bottlenecks. 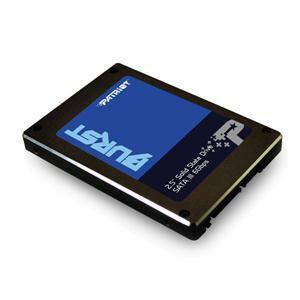 A SATA III 6Gb/s Interface that is backwards compatible with SATAIII 3GB/s, this SSD provides greater performance over traditional HDDs. At only 7mm high in a 2.5? form factor, the Burst is perfect for any ultrabook or laptop upgrade. Patriot?s Burst SSD comes in two sizes for every user, at 120GB and 240GB. With the Burst, Patriot has continued pricing very aggressively to offer one of the best price-per-performance rations on the market. Backed by Patriot?s award winning build quality and 3-year warranty; the Patriot Burst will deliver on of the most reliable choices in SSDs.